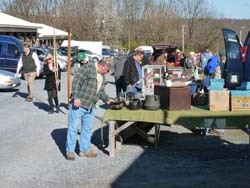 Renninger's Antiques Market in Adamstown is the final shopping mecca for antiques during the Famous Extravaganza weekends. Many dealers save special merchandise which they display during these special weekends. Also, many dealers make a special trip to set up in the special outdoor market only these three times a year. The outdoor market opens at 5 am. The indoor market opens at 7:30 am. If your shopping in the Adamstown area during these weekends you will often hear that shoppers and dealers alike. The outdoor market will begin at 5 am on Saturday for some exhibitors who make a two-day event out it. The indoor market is not open on Saturdays. 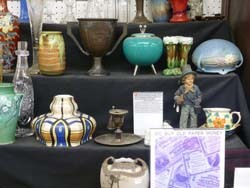 The main show, however, is Sunday, when the majority of dealers set-up and the indoor market is open. Space size: 16 ft. wide by 23 ft. deep. One table is included with each space, if available. Saturday & Sunday: $85.00 per space. Space size: 10 ft wide by 11 ft deep. Two tables are included with each space, if available. *Paid Reservations are advised. Inquire on the day of for extra tables and rate.